14.60.090 Service area fees and charges lien. That certain parcel, or tracts of land located on Revillagigedo Island, generally situated between the northern city limits of the city of Ketchikan and the northern end of State Highway #7 located south of Lunch Creek in ASLS 88-87. 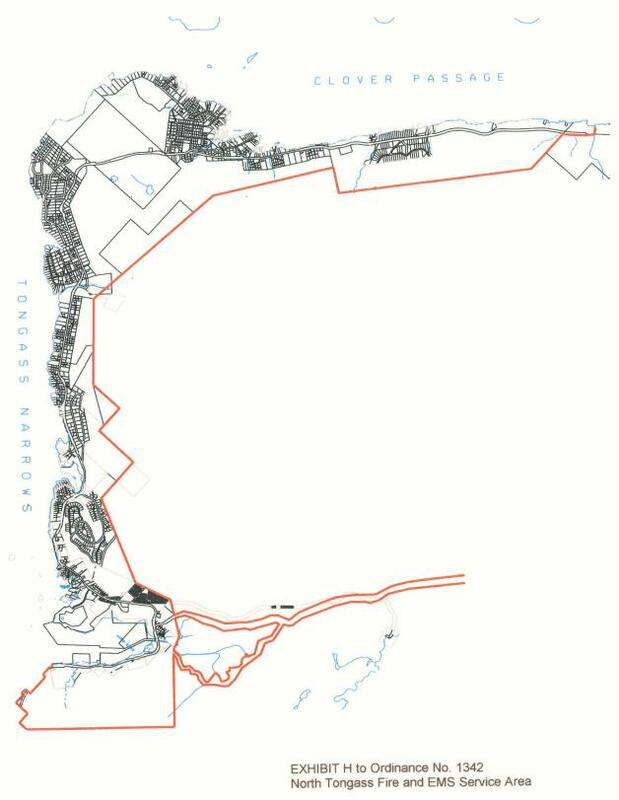 This will also include the roaded area from the intersection of North Tongass Highway and Revilla Road, north to Harriet Hunt Lake and also the roaded area to Ward Lake. Commencing at Corner No. 5 of U.S. Survey 1744, the true point of beginning, thence northeasterly to a point perpendicular to the northern boundary of U.S. Survey 3835, thence along the northerly boundary of U.S. Survey 3835 to the intersection of U.S. Survey 3835 and U.S. Survey 2632, thence south 68 degrees 10 minutes west a distance of 149.82 feet along the line of said U.S Survey; thence south 56 degrees 47 minutes west a distance of 266.44 feet along the line of said U.S Survey; thence south 48 degrees 49 minutes west a distance of 237.6 feet along the line of said U.S Survey to the eastern boundary of U.S. Survey 1658; thence along the boundary south a distance of 133.32 feet; thence west a distance of 99.66 feet to the eastern boundary of U.S. Survey 1508; thence south a distance of 976.8 feet; thence south 31 degrees 48 minutes west a distance of 1,067.22 feet; thence north 58 degrees 12 minutes west a distance of 463.98 feet to the northeast corner of U.S. Survey 1659; thence south a distance of 295.68 feet to the intersection of U.S. Survey 1605 and U.S. Survey 3834; thence south 01 degrees 17 minutes west a distance of 776.82 feet; thence west a distance of 271.65 feet to the intersection of U.S. Survey 3834 and U.S. Survey 1653; thence west a distance of 316.8 feet to the intersection of U.S. Survey 1653 and U.S. Survey 3833; thence south a distance of 549.12 feet; thence west a distance of 399.66 feet to the intersection of U.S. Survey 3833 and U.S. Survey 1656; thence west a distance of 295.68 feet to the northerly boundary of U.S. Survey 1207; thence south 42 degrees 55 minutes east a distance of 199.98 feet; thence south 47 degrees 05 minutes west a distance of 500.28 feet; thence south 04 degrees 34 minutes east a distance of 717.42 feet; thence south 44 degrees 50 minutes east a distance of 246.84 feet; thence south 41 degrees 37 minutes west a distance of 1120.68 feet; thence north 52 degrees 49 minutes east a distance of 1,232.88 feet to Corner No. 2 of U.S. Survey 1732; thence westerly along the southerly boundary line of U.S. Survey 1732 a distance of 55.44 feet to U.S. Survey 1271, Corner No. 1; thence south a distance of 561 feet; thence east a distance of 198.66 feet; thence south a distance of 1,289.64 feet; thence west a distance of 375.54 feet to the eastern edge of the North Tongass Highway ROW; thence southwesterly along the said ROW to a point where the ROW intersects U.S. Survey 1665; thence south a distance of 228.26 feet; thence east a distance of 114.84 feet; thence south a distance of 621.06 feet; thence east a distance of 894.85 feet; thence south a distance of 704.8 feet; thence east to U.S. Survey 1744 Corner No. 5 and the true point of beginning. All of the above-described parcels, and tidelands adjacent to the above-described areas, are included within the service area. An illustration depicting these boundaries is incorporated in this section; provided, however, that in the event of a conflict between the illustration and this legal description, the legal description shall prevail. (a) Fees and charges for the fire and EMS service shall be set through a combination of a fee as determined in this section and a service area mill levy by resolution of the assembly and collected in accordance with Chapters 4.45 through 4.55 KGBC. (1) One-story buildings used as tool and storage sheds, playhouses, and other similar type uses, provided the roof area does not exceed 120 square feet. (2) Houses with salvage value only listed on the assessment roll. (3) Fences of any height, landscaping, sewerage system, storage containers and other nonstructural improvements. (4) Docks, floats and boat ramps leading to floats are exempt unless they have a structure fitting the definition in subsections (d)(1) and (d)(2) of this section. (5) Structures not otherwise described in this section that are recommended by the North Tongass Fire and EMS Service Area fire chief, or his designee, to have no reasonable access by the fire department for the purposes of firefighting. (a) In the event any fees or charges, excluding the annual fee, are not paid within 25 days after the date of billing such fees and charges shall be delinquent. Upon such fees or charges becoming delinquent there shall be added thereto a penalty of five percent of the amount of such fees or charges, and in addition thereto, interest at the rate of one percent per month shall accrue and be charged on the whole of the unpaid amount of such fees and charges, not including penalty, from the date of delinquency until paid in full. (b) The owner of the property shall be personally liable for the amount of any user fees, charges, penalties and interest, which are assessed, levied or charged. (c) Notwithstanding other provisions of this section, delinquent accounts may be collected through any lawful means. The cost for collection of such accounts shall be added to the amount owed. (a) A person whose name appears on the assessment roll or the agent or assigns of that person may appeal to the service area board for relief from an alleged error in fee assessment to the owner’s satisfaction. (b) The appellant shall, within 30 days after the date of mailing of notice of fee, submit to the clerk’s office, attention North Tongass Fire and EMS Service Area, a written appeal specifying the appellant’s opinion of error for the appeal with supporting evidence in the form that the service area board may require. Otherwise, the right of appeal ceases unless the service area board finds that the owner was unable to comply. (c) The service area board shall direct the chief to mail to each appellant a notice of the sitting at which the appeal is to be heard, at the appellant’s last known address as the same is shown on the assessor’s records. Such notice is complete upon mailing. Such notices shall be mailed not later than five days prior to the date of hearing of said appeals. All such notices shall contain at least the following information: physical location of the hearing room; the day of the month and year; and the time of day. All such notices shall also notify the appellant that the appellant has the burden of proof that an improper fee was assessed based on facts that are stated in a valid written appeal timely filed or proved at the hearing; that appellant may be present at the hearing, and may present any relevant evidence. (d) The fire department chief shall prepare for use by the service area board a summary of data relating to each fee that is appealed. (e) A hearing officer and an alternate shall be appointed by the borough manager for the purpose of hearing appeals. (f) Hearings shall be conducted in accordance with Chapter 2.115 KGBC. (a) The fees and charges imposed under KGBC 14.60.060, including any delinquency fees, interest, penalties and collection charges under KGBC 14.60.070, shall constitute a lien in favor of the borough upon the real property for which the per lot fee was imposed, and upon the real and personal property of the responsible party for ambulance fees. (b) The lien imposed by this section arises and attaches at such time as payment becomes delinquent under KGBC 14.60.070 and continues until the entire amount is satisfied. (c) If fees and charges are not paid prior to delinquency under KGBC 14.60.070, a notice of lien may be recorded in the office of the district recorder. (4) Mechanics’ and materialmen’s liens for which claims of lien under AS 34.35.070 or notices of right to lien under AS 34.35.064 have been recorded before the recording of the lien under this section. (1) Filing of notices of lien: $25, plus recorder’s office filing fee.